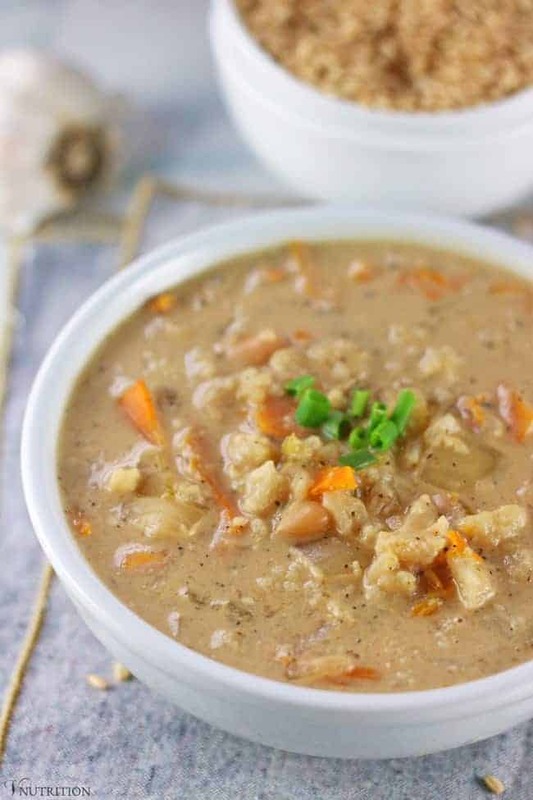 This delicious vegan Creamy Vegetable Soup is made in the Instant Pot for an easy meal. 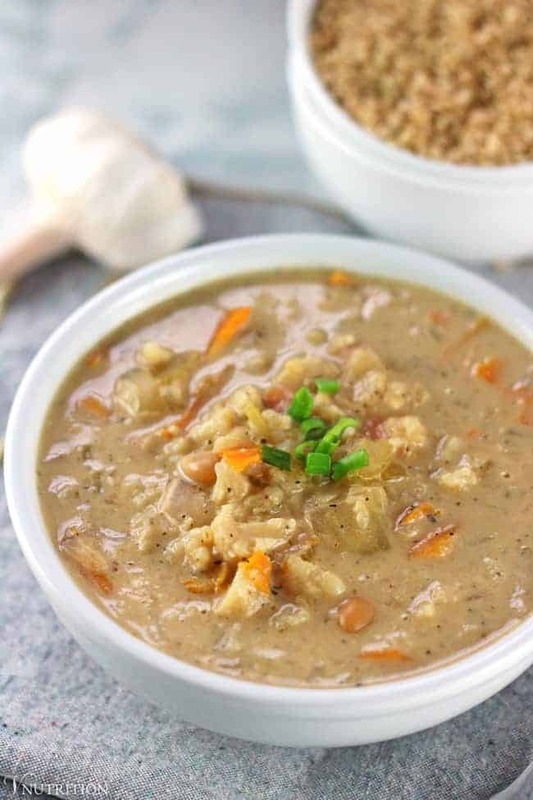 Carrots, celery, cauliflower and brown rice make this gluten-free soup a comforting and healthy lunch or dinner. Soups are some of my go-to meals. They’re usually really easy to make and can be so versatile. Some of the favorites I’ve share before are my Roasted Tomato Chickpea Soup, Vegan Colcannon Soup, and Hungarian Red Lentil Soup (just to name a few). I love a good soup on a chilly day (or even during the summer when the air conditioning at work feels like the arctic – you ladies know what I’m talking about). This Creamy Vegetable Soup is now on my list of soups in my rotation. It’s a favorite of my husband and my mom so I think the whole family will enjoy it! 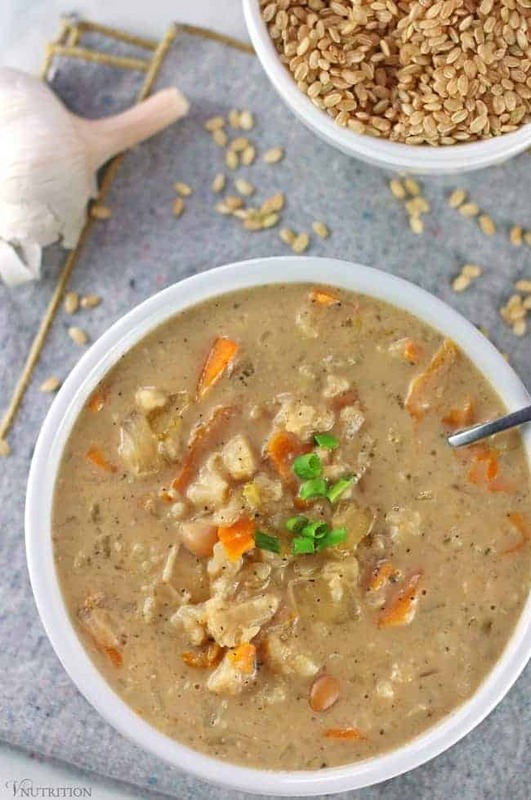 This Creamy Vegetable Soup is made in the Instant Pot to blend all the flavors together and make for an easy meal. 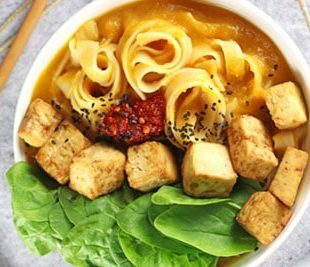 Plus the Instant Pot is so hot right now I felt like I needed to get on the IP bandwagon! There’s lots of veggies in this soup. I feel like the base of most vegetable soups needs to be carrots and celery…who’s feeling me? They just seem so “home-y” and comforting. 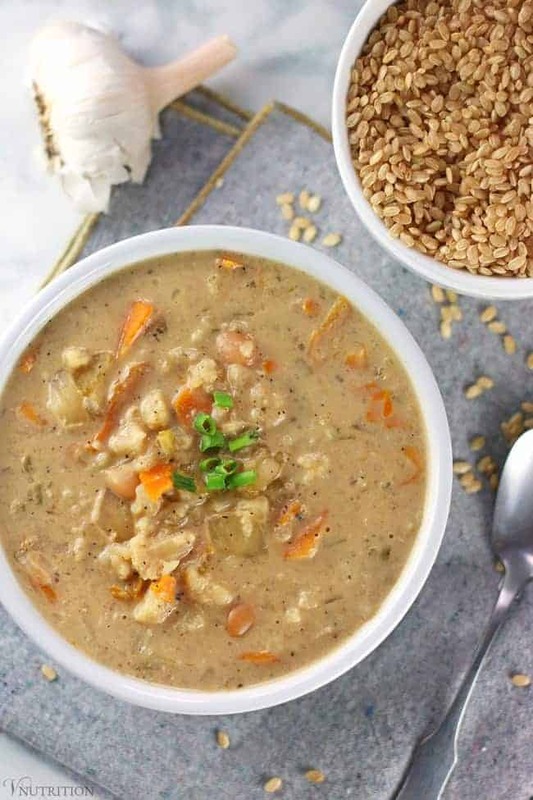 Instead of using just brown rice, I wanted to add another veggie and I’ve noticed that cauliflower seems to mesh well with brown rice when it’s cooked into soups and casseroles. Sometimes you can’t tell if you’re eating brown rice or whether it’s cauliflower. While brown rice can be a healthy addition, I love adding in the cauliflower for extra nutrients. 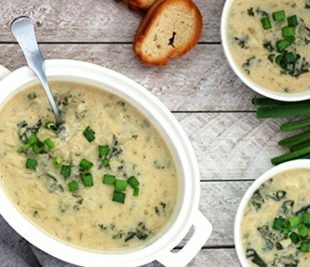 Speaking of nutrients, this Creamy Vegetable Soup recipe is packed with them! One serving gives you a healthy mix of your macros (carbs, protein, and fat), fiber, and Vitamin A, Vitamin C, and iron. 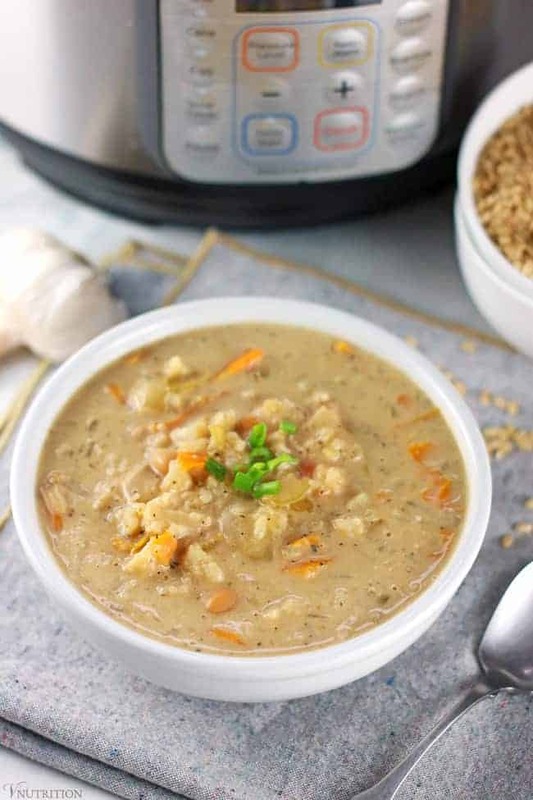 Carrots add the vitamin A, cauliflower gives us Vitamins C and B6, and celery is loaded with Vitamin K.
This Creamy Vegetable Soup comes together fast thanks to the Instant Pot. No need to precook the rice (though you know I love me some vegan meal prep). Note: If you’ve never used and Instant Pot before, be aware that it takes a little while for the IP to get up to pressure (about 10 minutes or so) before it starts to cook. My recipe calls for a “quick release” which is when you open the valve to allow the steam to release quickly. So you’d turn the valve from sealing to venting which will release the pressure. 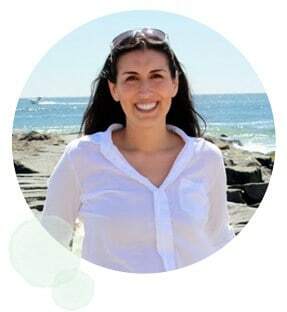 Feel free to do a natural release which lets the pressure release on it’s own however, a natural pressure release can take from 5 to 30 minutes. The reason I do the quick release is that I’m usually hungry and ready to eat! 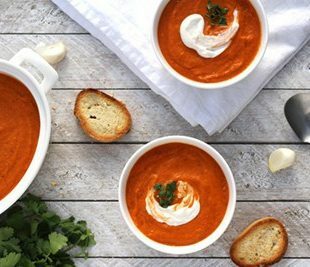 If you make this Creamy Vegetable Soup recipe, let me know what you think by ★ star rating it and leaving a comment below. 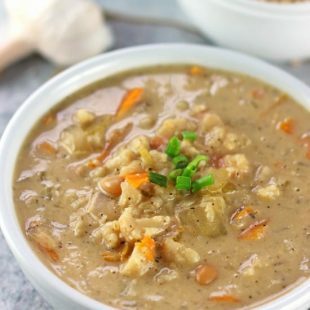 This Creamy Vegetable Soup is made in the Instant Pot for an easy and comforting meal. It's vegan, dairy-free, gluten-free and best of all, delicious! Meanwhile, add the raw cashews and water to a high speed blender and blend until smooth. Once the soup is cooked, "quick release" by turning the valve from sealing to venting to release the pressure and allow the steam to release quickly. Be sure to keep your face & hands away from the steam as it’s released. Once all the pressure is released, open the lid, add the cashew cream to the Instant Pot, and stir. I use a mandolin to easily slice up my veggies. I use a high speed blender like a Vitamix when blending the cashews. This creamy vegetable soup can last in the fridge for up to 5 days or freeze it for up to 2 months. If the soup is a little thick when reheating it, feel free to add some veggie broth until the consistency is to your liking. This soup looks perfect for a chilly day, love the creamy texture and flavors. Thanks! thanks Christine! It’s perfect for a chilly day! I hope you enjoy if you get a chance to try it Randi! Soup is a staple in my house too! It is definitely soup season and this looks delicious. Thanks Kari! 🙂 Hope all is well with you! This looks so yummy. Thanks for sharing the recipe. I hope you enjoy if you get a chance to try it!